Well after a glorious afternoon yesterday, the squalls have arrived and are keeping us on our toes; the whole sky is pretty much grey today. The sea is a bit more uniform but around 2.5 metres which means a lot of surfing. Yesterday afternoon we lost some ground as we had some issues with the main sail, this resulted in having to furl the genoa and turn up wind for a few minutes. We planned the exercise and geared up with all safety precautions, then timed the waves to make the turn. I was on the helm and Andrew was at the mast; my heart was racing but it was all good. We are now running a little more conservatively (ie racing the other boats has been suspended whilst Carolyn is awake- Andrew) with the main well reefed. The wind is increasing in the afternoons and as I write this we have about 25 knots and have seen up to 30 in the squalls. 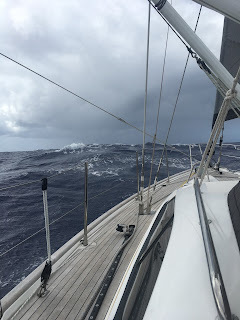 Askari just got a good wash off in the last squall the first with really heavy rain - we hid inside after we reefed the genoa…. We have a stow away on board today - a white sea bird joined us during the last squall and is pruning itself on the back deck. It's got beady eyes and is now all fluffy in the wind. I wanted to make it a tuna sandwich but Andrew thinks that's ridiculous - it did just poop in the teak so maybe it won't be welcome for long. I think it's enjoying Boy & Bear which is playing in the cockpit today…. Yesterday afternoon I made an incredible dahl and pretty nice zucchini fritters and this morning we had the best Mango ever for breakfast. Food is going well - when we talk to the other boats, everyone is into food and fishing - not much else to do out here…. Serenity has left the radio net as they went to the Cape Verdes, so Golden Breeze has taken over and we have picked up Milvina at last. We have not met Neil and Helen from Milvina but have been chatting to them for about a year, as they ran the Ocean Cruising Club rally that we kept missing in Spain and Portugal; it's great to have Neil on the net. Milvina is about 160 miles south east of us. The most exciting news is that we have passed half way - now we count down!